← >The best from "les copines" is the very best! Wednesday is baking day in my house and for tea we ate these! Now, I’d have waffles anytime over pancakes… but I am always searching for the ultimate waffle recipe – at least since I bought my waffle maker last year during that massive snow fall… I want a light and buttery waffle, something crispy and melting at the same time. And today I’ve cracked it ; here it is: the ultimate waffle recipe! Split your egg whites from their yolk. Then add the yolks one by one to the mix. Use an electric whisk for that and add the cream and flour, bit by bit. It should be creamy not lumpy. I like serving these with a blackcurrant sauce or melted chocolate with butter and a few slices of banana. Their buttery flavour hardly needs anything though… The one in the picture has caramel sauce. I credit this recipe to the booklet compiled by the mums of Lübeck school in Paris. Recipes tried and tasted over generations! A treasure-trove, I tell you! 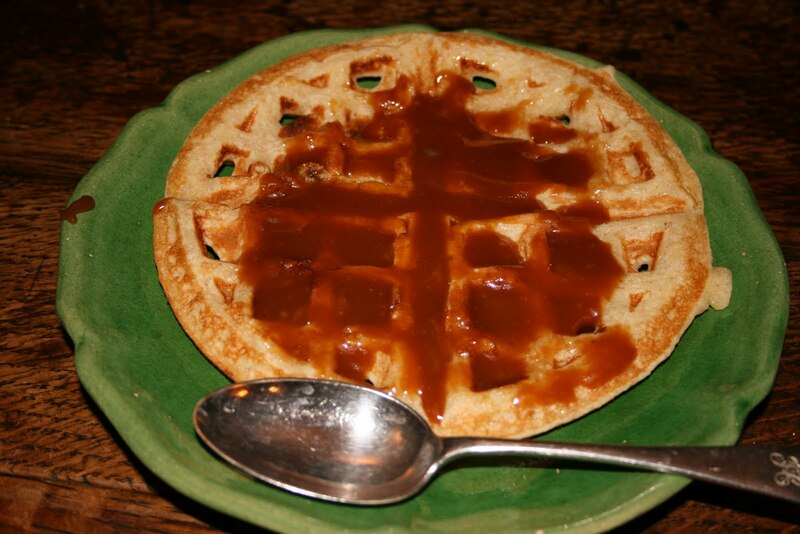 This entry was posted in baking, treats and tagged buttermilk, caramel, dessert, vanilla, waffles. Bookmark the permalink. We made them yesterday again! Vive la neige!